No relation to the seller. Made for a big feller! ...or a very tall lady of course. Here's my new ('91 vintage) 59cm Sini super prestige, built with Reynolds 501 (weird ik, but confirmed by the beautiful Ms. Barbara Tommasini herself). She's got a little 'scuff' on the head tube, but originial paint! She is currently just a frameset, as I decide how to build her. I don't think I put my recent find on this posting. Confirmed from Italy it is a 1989 Competizione, picked up without wheels, mix of 8 speed DA STI and 600 tricolor. It sat on C/L for about a week, 4 hours from me. I finally caved in and drove down to pick it up. Naturally, the stem was stuck.. Got that out, and pulled out some Ritchey wheels I had laying around, and put the Modolo bars and stem on it. I probably need a shorter stem, otherwise, size is OK.
Not sure why someone in Charleston did not jump on this bike. It did take some imagination. I need to update my pics, as I have made a couple of more changes. Rear brake cable/housing was seized in the top tube. That was fun to replace, as I am not that patient. Its rare for me to get anything Italian, as my self imposed $$ limit per bike usually eliminates them as choices. Last edited by wrk101; 07-19-12 at 03:18 PM. Bill, I looked at that Tommasini in Charleston long and hard but I talked myself out of the drive to go get it. Now I'm regretting it, lol. It looks great. Is it a keeper or seller? 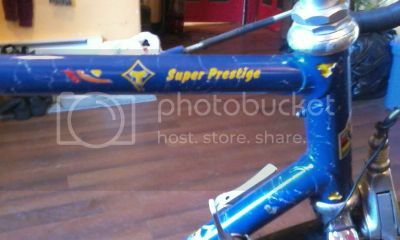 I've only seen the Super Prestige in either SLX or SPX. I'm guessing someone put that 501 sticker on it. Did Barbara say that they used Reynolds on any of their bikes? Its a keeper. I tend to go through keepers, so nothing is really safe. Here's some more Tommasini. Not really a great pic, cell phone pic before class. 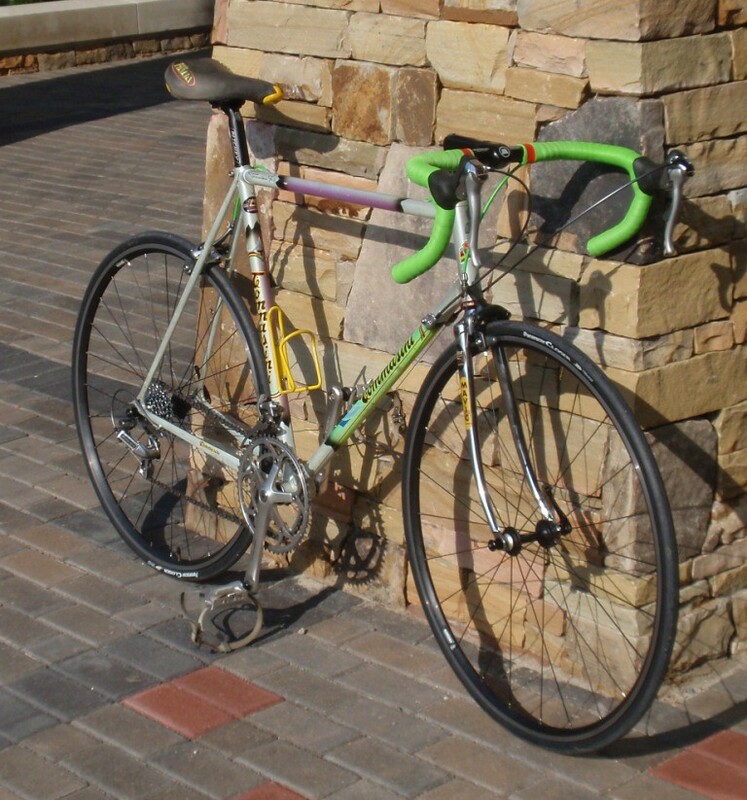 I actually don't have many pictures of my Tommasini which is surprising. I am not sure of the model and year as the decals are worn and there aren't any columbus decals left. Given the mix of Nuovo and record parts, I think it's mid-80's with somebody upgrading non-aero brake levers to aero levers. But it's a great patina and the ride is smooth and responsive. It's definitely a treat to ride especially with the tubulars on. I ride it mostly with clinchers given the street debris and stickers in my area. I also popped two new tubies within a 100 miles of riding . . not great on the wallet and I shouldn't have been riding through the streets at night with tubies. Pictured are gp4000 tubies on wolber aspin and a mavic gp40. Better pics to come. Last edited by rivas7200; 08-06-12 at 07:50 PM. Turn my back for a second and you guys post all of these cool bicycles and jerseys. I'll be reporting with my 1990 Super Prestige within a couple of weeks. New tires. Veloflex Master 23s. New bars. Trying the Cinelli reissues. Ordered two different bars to see what works with the Record Ergos better. New stem. Traded with Whatwolf, which reminds me I owe her a pm tonight. Another Cinelli XA. New cables and housings. All new cables and Jagwire black braided Racer set. New tape. Black Fizik Microtex of course. New saddle. Black Regal reissue received on trade from Leaping Gnome. New brake pads. Can't decide between Swiss Stops, Kool Stops, or nos Campy replacements. Decisions! While I had her down to the frameset, I frame savered her, repacked all bearings and had the frame aligned at the shop. Had the wheels trued as well, but they were almost spot on. Hard to beat Record hubs, DT spokes and Mavic Open 4 CDs. Nice work Grady. It probably doesn't look like the same bike anymore. Does this mean she is a keeper for sure? Have to keep this one. One of those moments when you find a frameset that was built just for you. The frame details are unique and of a special quality. .....and the ride is sublime. Irio Tommasini certainly could build a frameset. Curious though, if he did build this one. Last edited by gomango; 08-11-12 at 07:37 PM. Here's some photo's of my new bike! What a Craigslist find! Still waiting to find information on the frame from the factory since they are on holiday, but will update when I know. So far its a great ride. Been riding about 150 miles a week and have had no problems. She looks like she's in incredible condition. Bet she's fun to ride! Yes really nice find. I think I have found a similar frame for sale but chrome headtube and and slightly different treatment to front fork. Interested to know opinion on age of either/both? I believe it's a Tommasini Racing early 80's SL tubing. Depending on price I say go for it. 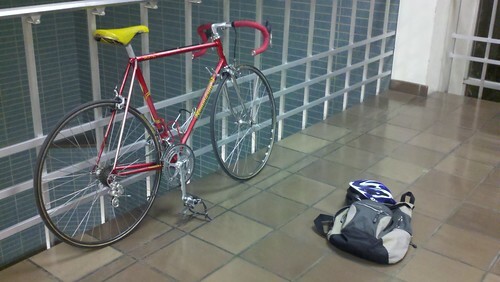 I've never met anyone who rode a Tommasini that love it. Gomango and I are starting a sub forum of the Tommasini Lounge called the White Marble Tommasini Lounge. I just got this from a very nice guy in Boulder. It should arrive late next week. The bike is near mint and the chrome is in great shape. The Shimano 600 will be replaced with Record 8 speed. If anyone has an interest in this very nice Shimano 600 three color group, 7 speed indexed, send me a PM. Last edited by cpsqlrwn; 09-07-12 at 01:52 PM. It looks great already but campy 8 will suit it better. Found out from factory the info! It is a 1976-1977 Tommasini Prestige Built with Columbus SL tubes. I received confirmation that mine is a 1990. Bet your beauty is the same year as mine. They didn't have as much paint left in the cans to throw and drizzle all over yours. Is it splatter painted like Bob's and mine or marbled? I think 1990 and 1991 was it for these white frames with multi-color splatter paint. I did see one in St. Paul that was black and pink with silver marbling. That was an incredible color scheme! Blue with white "splatter". Got an example of "marbling"? Not sure of the difference. I think I may be splitting hairs here Andy. I've seen the white with multi color paint effects referred to as "splatter." I've seen yours referred to as marbled. This may be just a semantics game I played on these. Send the email to Barb just for grins. I'm thinking yours is a 1990 as well.